Melody Burton, Chief Librarian at UBC's Okanagan campus, is about to receive the Canadian Library Association's highest honour, the Miles Blackwell Outstanding Academic Librarian Award. The award recognizes Burton for tireless service to the profession, unwavering commitment to mentorship, and excellent leadership within various libraries. 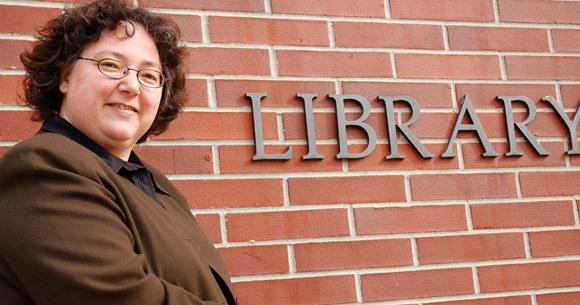 Through her career, Burton has made an impact at many academic libraries: Concordia College in Edmonton, University of Alberta, York University, University of Windsor, Queen's University, and UBC's Okanagan campus where she has been Chief Librarian since 2005. "This is a tremendous honour for Melody, and reflects the leadership, professionalism and dedication she has shown here at UBC and throughout her career," said Doug Owram, Deputy Vice Chancellor and Principal at UBC's Okanagan campus. "Since 2005 we have seen our Library grow from serving 3,500 students to meeting the needs of more than 7,000 undergraduate and graduate students," he said. "It has been a remarkable time of growth, and Melody's experience and passion have allowed us to expand and continue to deliver excellent Library programs and services." Burton is known as an inspiring leader with an imaginative approach to problem solving. Nominators described her as a "natural leader," "a woman of insight" and "an advocate and an activist." The Miles Blackwell Award will be presented to Burton May 27 at the Canadian Association of College and University Libraries Annual General Meeting, during the Canadian Library Association's national conference in Halifax, Nova Scotia.